It was the winter of 1994. To go to Tibet was a new experience and exciting for me. It was not easy to go there. There are numerous obstacles on this adventure. There is no train, for example. There are only five roads that go there, each one is extremely dangerous, leading through gigantic mountains and deserts. But that is not all. Beside the natural obstacles, there are man-made hindrances too. Foreigners were not allowed to travel in these regions. But it is the place where the lives are hardly touched by the modernization. In Lhasa we check in to a Tibetan hotel in the old quarter, very close to the Jokhang Temple. After morning yoga and breakfast, we visit Jokhang Temple, built in the 7th century; the Jokhang is the spiritual heart of Tibetan Buddhism. Pilgrims from all over Tibet gather, walking with meditation prayer beads (rosaries) and prayer wheels in their hands, focusing only on a good rebirth and achieving enlightenment. In each of Jokhang’s 30 chapels have different statues of Buddhas, deities, lamas and protectors that have been collected between 639 and 1959. 1000 chapels! There are gold-embossed tombs of past Dalai Lamas, one of which is called Zamling Yeshag because of the amount of gold, precious gems, and countless artifacts contained in the tomb. This morning we went to the Drepung Monastery, historicaly the largest monastery in Tibet. Our tour includes a visit to the Dalai Lama’s first palace and the Great Hall that once held 10,000 Tibetan Buddhist monks doing prayers and rituals. Drepung was relatively less destroyed by the chinese government during the Cultural Revolution and therefore possesses more holy relics. This is also an opportunity to meet some inspiring nuns who have been meditating in a cave near the monastery for many years. 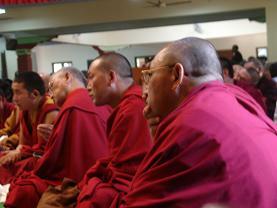 No matter how difficult life gets under the oppressive china regime the Tibetan spirit remains strong. Each day we eat delicious Tibetan food and chinese food. There are two dog at the hotel called Lhasa Apso that we play with a little bit. They are cute and friendly. The next day we leave early to drive to the world’s highest mountain, the Jomo Longma (Everest). It is a day-long drive via Shikatse (also Shigatse) where we have lunch. Driving through many scenic mountains and valleys, we spend one night below Jomo Longma (Everest) at a monastery. As the crown of the earth gets sunlight, we drive up towards it, to the famous Everest Base Camp, 17,000 ft above sea level. Here, we set our feet on the mountain that every mountaineer dreams challenge with , we spend our morning. If our strength permits, we may do little hiking. In the afternoon, we drive back to Shikatse. I enjoyed very much and you can do too. Join in and write your own page! It's easy to do. How? Simply click here to return to Tibetan Travels.